So, you want to go to a meetup. Why should you go? 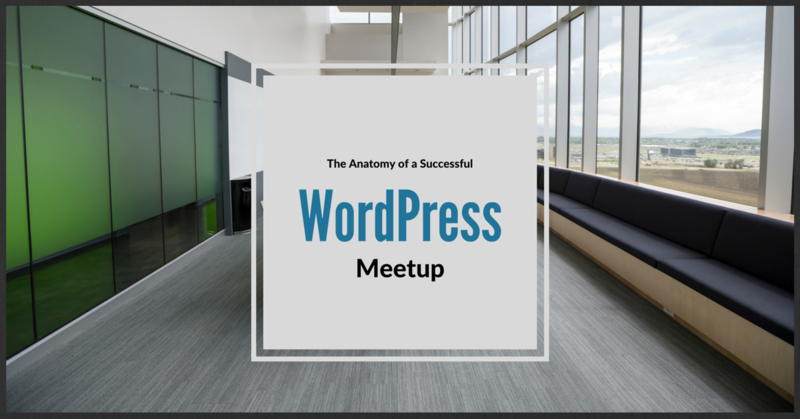 What should you expect from a WordPress Meetup? What questions should you ask and which should you answer? Why should you attend a meetup? Attending a meetup is amazing. I know, really descriptive. But sometimes it’s hard to describe the connection you feel when you’re in a room with people who share common goals and values. You have connection, empathy, shared experiences, and, of course, networking opportunities for your personal and business brands. As Matt Cromwell explains in his FooPlugins article, sometimes meetups are valuable just to get you dressed and out of the house. Many people in the WordPress space either freelance or are remote workers as part of a semi- or fully-distributed team. Automattic and Buffer are two examples of large companies that are 100% distributed. In this digital world, we forget that the best way to connect with people is face-to-face conversations in person. There is only so much you can get out of a Slack Channel. Am I right? Why does meeting people matter when you work on a computer? In other words, “I don’t want to get dressed today.” So, that’s me. But people need people. I know, cue Barbra Streisand. It’s a cliché but it’s true. People challenge us. They hold us accountable. They make us believe that we can reach for something we didn’t even know existed. Listening to other people talk about their current challenges with their site or how they closed a new contract or how they created a new career is inspiring. When we tell other people our goals, they seem more real — to us. But I’m only a blogger. So was I. So were many people. That’s the amazing part of WordPress. Its mission is to democratize publishing. WordPress gives people a voice. The first thing we need to stop doing is calling ourselves “only” a [fill in the blank]. Some developers think they’re “only a front-end dev.” Self-identifying in that way only limits us. Writers are very important to website development, too. As I recently told Shawn Pfunder in a tweet, in many ways content is why sites exist. Writing your story helps others relate to you. Writing is giving. Your voice gives you power — personal freedom. I could go on and on but this article is about meetups. Yes, you can attend a WordPress meetup if you “only” blog. What should you expect from the meetup? Expectations are important for the new-to-WordPress person as well as the new-to-your-meetup person. Every meetup has its own flavor. Some have scheduled topics, more formal presentations, while others are formatted more like an AMA (Ask Me Anything). Also, it’s okay to bring your questions. Many meetups set aside time for a happiness bar or Q & A Session. The General Meetup in Orange County is entirely fueled by questions. Other meetups are speaker and/or topic driven. As a new attendee, check out the meetup you want to attend. Look at their past meetups, read the previous comments. Do some research. Do they have a website or social profiles? Follow the Organizer on Twitter. Comment in the event and let people know you’re new. It breaks the ice for you and for the organizers. When starting his new Advanced WordPress meetup in Pasadena, Alex Vasquez wrote a post as a way to introduce their mission and format. That’s a great tip to make sure people understand the purpose of your meetup. “This is not a beginner’s meetup. That is to say, we do expect you to have knowledge of using WordPress beyond the basics you might hear about at our other general Meetup. The Northwest Valley Arizona WordPress Meetup puts their agenda and mission in their Meetup.com event pages. So, for each event, you know what to expect. 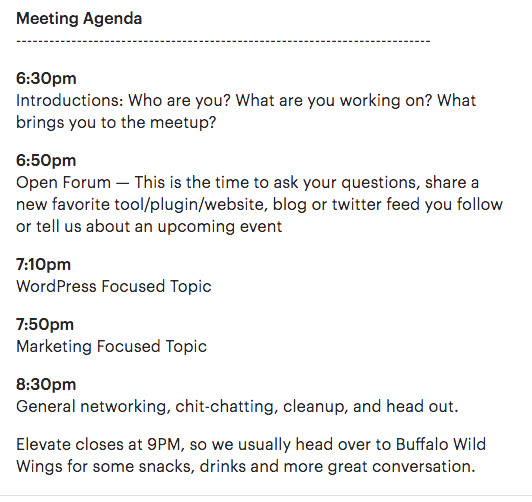 Setting up your agenda like Northwest Valley Arizona’s WP Meetup is a good tip for managing expectations. What about starting a meetup? If there is no meetup near you and you long for the connection, learning, and community, start a meetup. The Community Team at WordPress.org supports the expansion as long as you agree to their guidelines. They’ll even cover the cost of being on Meetup.com. And they have tons of advice on their site, too. You will never please everyone. If the first Tuesday of the month works for you and your co-organizers, do it. Be consistent. People will not always be able to attend but you should become a fixture in their lives. It takes a few times to form a consistent habit. Start your meetup with an incubation group — two or three friends. Doing it alone will not be good for you, your group, or your mental health. Be intentional. Find at least one more person who shares your values and vision and run with it. The great thing about meetups is it’s a good way to break the ice. But if people don’t feel welcome, awkward silences ensue and they may not return. Now, as the organizer it’s not all on you, but I’d say a good 75% is on you. For smaller groups, name tags might be an option. For a large group, I’d invest in some name tags. For Women Who WP, Jen, Elizabeth, and I work very hard to sit among the people who attend our meetup (not with each other). This was a deliberate, intentional decision. We’re not here to have a girl date, we’re here to build people up. We take turns being the greeter at the door and welcoming people. We are active on our Facebook Page and in the meetup group. Meaning, we respond to comments and are generally encouraging. We make a point to pay attention to who RSVPs and know their name. Remember, the reason to have a meetup is to build a community. Community doesn’t happen by magic, it’s intentional. If you want people to recognize you as a new member, use an up-to-date photo for that group. Meetup.com allows you to have a global photo (here’s my profile) and a profile picture for each group. It’s not a requirement by any stretch of the imagination, but it does help. Finding a venue can be a challenge. Choosing a venue is an important first step. It sets the tone for the meetups. If it’s a co-working space with desks, outlets, and killer WiFi, you’re ready for a hands-on workshop. If you want a more social setting, a back room of a restaurant can be good. Meetup.com has some great questions to help guide this choice. Promotion is great but so is a more private venue for ongoing discussions. You may want to have a closed Facebook Group (or Slack Channel) for more private conversations, but a Facebook Page and Twitter account can help keep people up-to-date on your latest events. This is especially important if your meetings are irregular. Should you encourage RSVPs? Quite possibly. If your meetup is in a banquet room that requires a minimum number or if you’re providing food, the RSVP is essential to your planning. Often people decide whether or not they’re attending based upon the relevance of the topic. So, announcing the topic ahead can be a good practice. Also, all members of the leadership team of your meetup should RSVP on meetup.com which encourages others to RSVP, too. Sponsorship is awesome, especially because venue costs can be expensive. But you should consider the value system of the sponsor and how that aligns with WordPress. Remember, this is a WordPress meetup. It’s encouraging to be supported by one’s peers. This is one of the benefits of an interest-based group. Not only can you learn from one another, you can refer work to others, partner up to take on larger clients, and generally offer praise. And this is a great place to find the kind of mentorship that we all need to level up our professional lives, too. It starts with connection. Recently on WPblab we discussed this very topic with a veteran WordPress Meetup Organizers: Alex Vasquez and Russell Aaron. Watch to hear more advice and entertainment below. So, do you attend a meetup? Did you start one? Do you want to?